Sunshine Soba Noodle Stir Fry and Contest! This recipe is extra special! Not only is it loaded with vegetables and delicious flavor, but it is also the first recipe that we are posting with a contest on the Sunny Seed Up Blog! First the Recipe: This meal is packed with vegetables and umami flavor. The soy sauce, soba noodles, garlic, and ginger really bring out the shiitake mushroom flavor of the Sunshine Burger in this meal. With six different types veggies, this meal is also packed with nutrition. Feel free to add or substitute your own favorite vegetables or whatever is seasonal or your CSA box when spring and summer come around. Now for the contest: leave a comment on this blog post telling us your favorite thing about this recipe AND post a picture on Instagram of the recipe once you have made it at home. Make sure to use #SunshineBurger in the Instagram post. One lucky winner will win coupon for a free package of Sunshine Burgers and will be selected next Saturday, 3/8 at noon PST. Contest is limited to residents of the United States. Combine all of the sauce ingredients in a small mixing bowl and whisk until well combined. Set aside. Add one half of the garlic and all of the ginger into a wok with the sesame oil. Heat until fragrant, about 1 minute. Add the carrot, celery, broccoli a pinch of salt and ½ of the sauce. Cook, stirring frequently until the broccoli is bright green and slightly tender. Add the corn, water chestnuts, and cook stirring frequently for 1 minute. Add the cooked noodles, sprouts, remaining sauce, and remaining garlic. Continue stirring until all of the sauce, noodles, and vegetables are well combined. I used a wooden spoon and tongs to really toss and turn the noodles. Combine the cornstarch and water in a small mixing bowl to form a slurry. Add the slurry to the noodle mixture. Continue to stir and scrape until the slurry is completely combined with the noodles. Turn off the heat and add the Sunshine Burger crumbles, stir again until Sunshine Burger is well combined. Add salt, pepper, and garlic powder to taste, then serve. Garnish with cilantro, peanuts and Siracha. 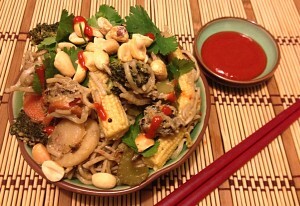 This entry was posted in Dinner Recipes, Sunshine Burger recipes, Uncategorized and tagged asian inspired meals, baby corn, broccoli, carrots, celery, cilantro, contest, free coupons, garlic, ginger, honey, mung bean sprouts, peanuts, quick home dinners, Shiitake Sunshine Burger, soba noodles, soy sauce, vegan dinners, vegetarianmeals, water chestnuts. Bookmark the permalink.